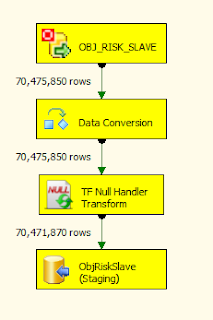 In previous posts I mention the performance benefits of loading sorted data into target tables. I'm currently loading data from Oracle 10, which exhibits a rather strange characteristic... Oracle does not use make us of an index for ordering data. In other words, Oracle only uses the indexes on a table for the sake of solving where predicates and joins... if you simply want to select all records from a table then an order by clause will force a table sort operation every time the query is run. This will place significant strain on a production database, and thus represents a relatively unacceptable solution. Load all large Oracle tables into SQL staging tables. Use SQL queries to perform simple joins, lookups and sorting to transform the stage into the data warehouse target tables. Use the Attunity source component and set it's BatchSize property to match the data flow's DefaultBufferMaxRows property. Set the FastLoadMaxInsertCommitSize of the OLE DB desgtination to the same value as the data flow's DefaultBufferMaxRows. Consider using the Data Conversion component for changing the type and column name of the source columns. This keeps your Oracle queries neat and readable, whilst also allowing you to handle invalid values (we're looking at you, Oracle DateTime) within the data flow, instead of having a query that fails halfway. If you have the budget, grab a copy of Pragmatic Work's TaskFactory. Among many other great components, it offers a Null handler, and a Data Cleansing transform, both of which are huge time saves when dealing with Oracle source columns. Don't rely on indexes supporting any order by clause in Oracle. Do use staging tables to support cleansing and transforming data. Pay attention to matching the buffer & batch sizes for the source, data flow and destination.